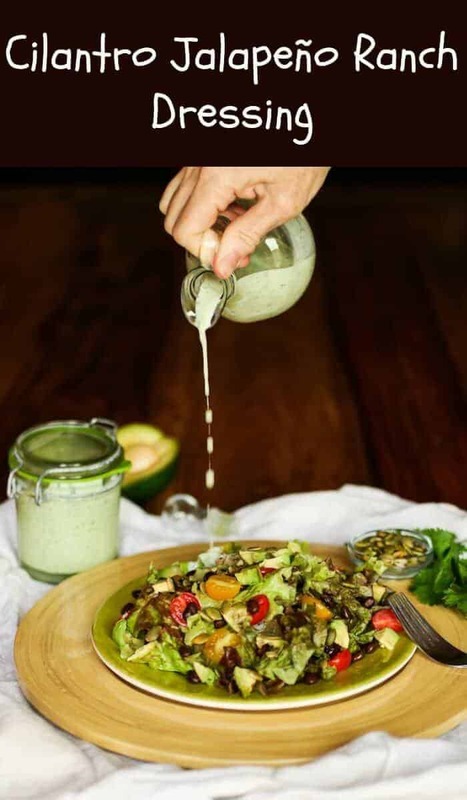 Southwest flavors in a healthy and delicious homemade ranch dressing… Cilantro Jalapeño Ranch Dressing Recipe uses fresh, healthy ingredients to complement your fresh salad ingredients. Recipes are great, and learning to follow a recipe is a necessary first step in becoming an accomplished home cook. One of the main focuses of Beyond Mere Sustenance, however, is to encourage my readers to “learn the rules like a pro,” to facilitate moving beyond a recipe to using flavor profiles and a well-stocked pantry along with seasonal and fresh ingredients to create new and wonderful dishes. Salad dressings are one of the easiest and most forgiving places to start. 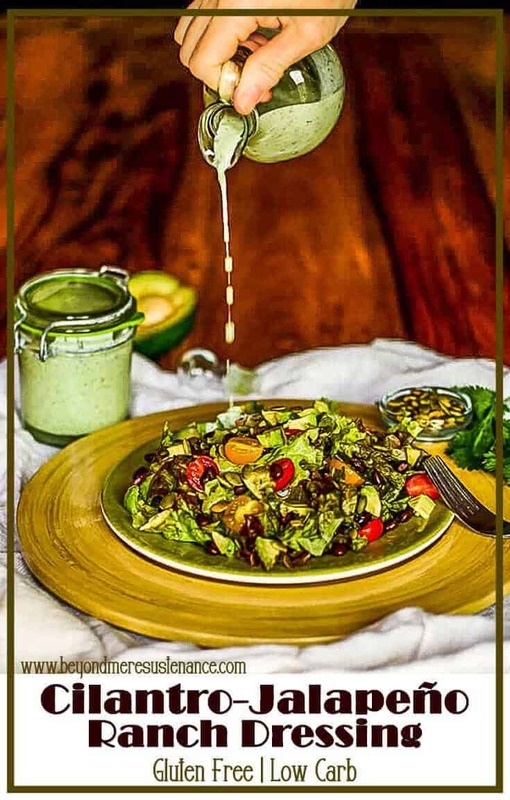 Cilantro-Jalapeño Ranch Dressing Recipe takes only minutes to prepare, and you can take the basic “recipe” and customize it with different herbs and flavorings to complement whatever seasonal and fresh ingredients find their way into your salad bowl on a given night. So in reading through this post, and then in looking at the recipe, keep in mind that it is more instructional in nature, and the recipe is more of a template. 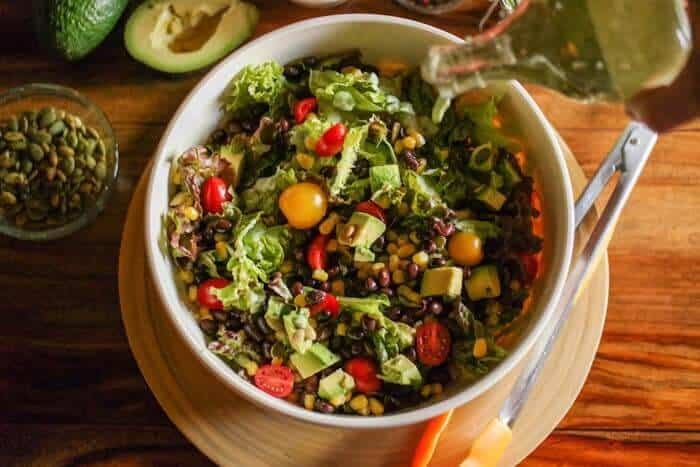 Since I’m focusing on a salad dressing with southwest-inspired ingredients like cilantro and jalapeño, my salad calls for ingredients like black beans, pepitas, avocado, and tomatoes. Don’t limit yourself to the list in my recipe. 😉 Other potential ingredients might include grilled corn, chopped zucchini, jicama, red or orange bell pepper, radishes, cotija cheese, etc. Cool? 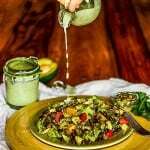 Have you made your own homemade salad dressings? If not, go look at the back of a bottle of dressing in your fridge. The list of ingredients may convince you! Southwest flavors in a healthy and delicious homemade ranch dressing... Use fresh, healthy ingredients to complement your fresh salad ingredients. Add all dressing ingredients to the bowl of your blender. Pulse 2-3 times. Give it a good shake. Repeat until smooth. Either toss with the salad, or serve in a cruet alongside the salad. Combine ingredients either in a large salad bowl, or divided among 4 salad plates. Garnish with pepitas. I love to make my own olive oil mayonnaise, but I certainly keep a good commercially prepared one in my refrigerator. 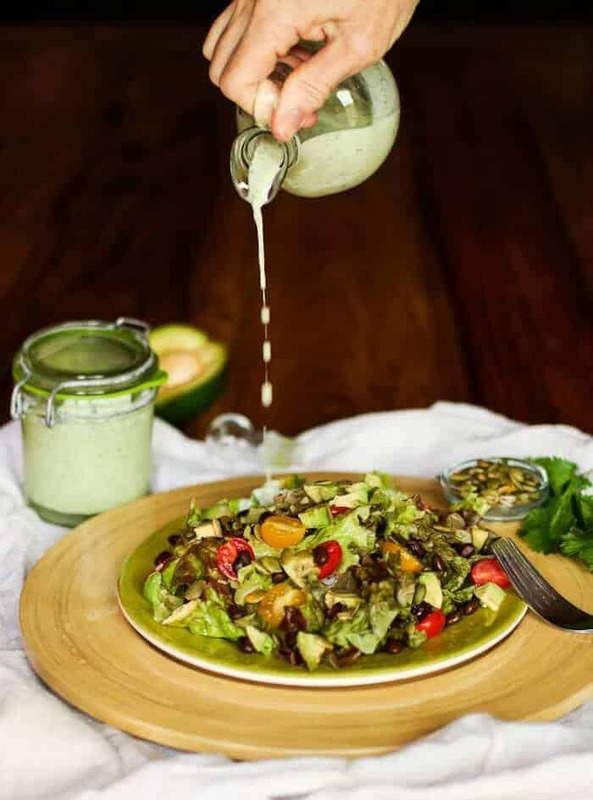 Salad dressings need a little bit of fat; fats aid in the absorption of some nutrients, and make the ingredients taste better too! Frozen and thawed corn is fine, but grilled corn cut off the cob is better. Creamy dressings will keep in your refrigerator for several days - if they last that long! Salad will serve about 4; the dressing about 16 servings. Thanks for including my recipe in your roundup! I do keep a bottle of commercial dressing on hand for when I'm extra short on time, but making dressings is so quick and easy, I rarely rely on it. Instead, I rely on a well-stocked pantry and refrigerator :-) Thanks for stopping by!